Many file hosting companies has shut down but RapidShare is probably one of the most resilience and smartest file hosting company that is determined to stay in business even after being sued for copyright infringement liability. The end up winning the case with the German court declaring them as legal. If you want to purchase a premium account from a file hosting company to host your files, get it from RapidShare and it probably won’t go wrong. 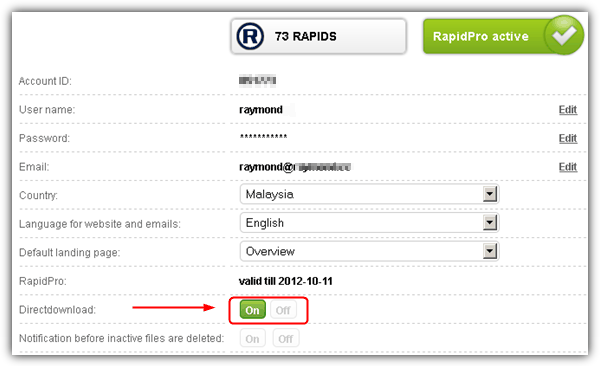 To get a RapidShare premium account, you need to have enough Rapids points to convert your account into RapidPro. You can either purchase the Rapids or you can even get them for free by shopping online, watching videos, completing surveys or signing up for services. Once you have a RapidShare premium account, the next thing that is left to do is to learn how to automatically download multiple RapidShare links using a download manager. Unfortunately not all download managers out there support downloading from RapidShare because it is much more complicated than the normal HTTP direct links. We have tested a few popular download managers with Rapidshare and here are the compatibility results. There are 2 ways to download files from RapidShare. The first method is to add multiple RapidShare links to the download manager and either use the Free or Premium account to automatically download it. This method is mostly used by downloaders that leaves their computer turned on the whole night to download all the stuff they want. The second method is by visiting the RapidShare link from the web browser and see if the download manager will catch and download it for you. To automate downloading with RapidShare Premium, it is important to turn on the Directdownload feature from your RapidShare account. Login to you RapidShare, click on My RapidShare tab and click the On button for Directdownload. Do take note that RapidShare uses cookie based authentication to recognize you as a premium user. It does not use the HTTP authentication so all you need to do is just login to RapidShare from your default web browser and don’t logout. There is no need configure your download manager to use your RapidShare username and password. Your download manager must be able to read the cookie from your web browser and support SSL protocol. If any of the requirement above is not met, your download manager will fail to download automatically from RapidShare. Orbit Downloader, FlashGet and Internet Download Accelerator does not support RapidShare because it failed to download in all conditions for both free and premium users. As for Free Download Manager, it is able to download from the web browser either through directdownload from Premium or manually clicking the Download button as a free user. Oddly, it does not support batch download if you add multiple RapidShare links to the download manager. Mass Downloader doesn’t work at all for Premium users because it lacks of SSL support. However you can visit the RapidShare link from web browser and click the Download button which will download using the conventional HTTP method due to free user. iGetter can only download by visiting a RapidShare link from the web browser using a premium account. Internet Download Manager, probably the most famous download manager of all time is able to support downloading from RapidShare. If you have a premium account, you can add multiple RapidShare links to the program and it will automatically download for you. It can even pick up the download when you are downloading as a free user from your web browser. Download Accelerator Plus is probably the best of all because of the new DAPsters feature to support automatic downloading from file hosting sites such as RapidShare and many more. It is able to download from RapidShare in any way and the best part is free users can automate downloading by pasting multiple RapidShare links to the download manager except without resume support and slower download speed. Another method that is worth mentioning is by using the DownThemAll! add-on for Firefox. After logging in to your RapidShare Premium account and enabling the directdownload feature in your control panel, you can add multiple links to DownThemAll! and it will automatically download all the files for you. There is a free download manager called RapidShare Manager (RSM) created by RapidShare themselves that runs on Java. It is able to simultaneously download multiple files from RapidShare but it requires a Premium account. If you’re going to use RSM, we would recommend JDownloader instead. JDownloader is a much more powerful Java based download manager which supports hundreds of file hosting websites and also direct HTTP links. Thank you so much! The direct-download thing wasn’t checked, so I couldn’t use any download managers. And now it’s sorted! thanks for the tip, i’ve been using orbit for a fair bit and its awesome. insanely fast on my premium rapidshare account. this tip of yours helped me from opening file per file in a browser n then downloading it. thanks m8. Wow, thanks… I am saving so much time downloading now. Perfect. Just tested now and found out “Free Download Manager” Also works well with Rapidshare.